BRISTOL, R.I., December 8, 2017- The Justice System Training and Research Institute at Roger Williams University in Bristol, R.I., in partnership with the New England Association of Chiefs of Police, recently recognized Sergeant Craig Forget of the Rehoboth, MA Police Department for the successful completion of the “Command Training Series: First Line Supervisor Course,” a two-week comprehensive training program for police supervisory personnel. Coursework addressed contemporary concepts of management and leadership relevant to the responsibilities of first line supervisors in a modern criminal justice agency. 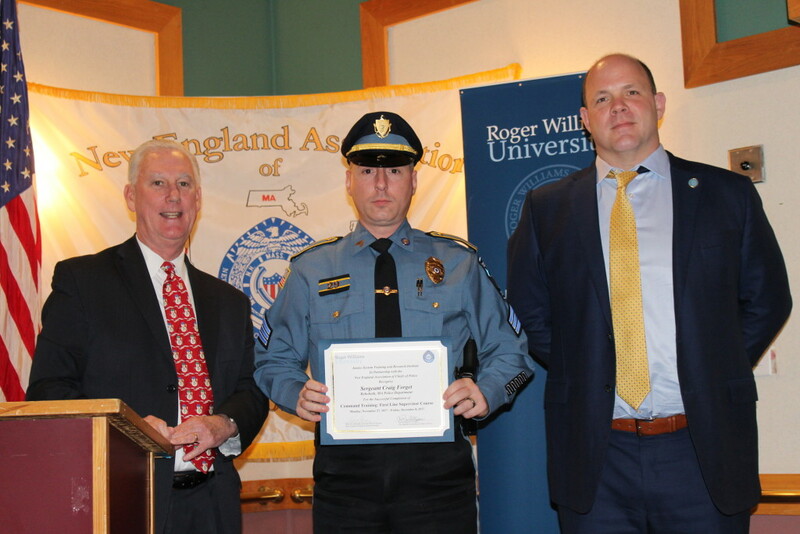 The program , presented by experienced academics and law enforcement practitioners between November 27 and December 8, 2017 discussed topics including operational leadership and management principles, problem-solving , organizational and interpersonal communications , labor relations, disciplinary issues, and ethical decision-making.